Download Paid Apps For Free On iOS 12 – Whenever we don’t have anything to do then we search the app store and look for the random applications. If somehow we found such great apps so we see that some of them are free and some are paid. but the point is that can we download those paid apps for free then, of course, you know it’s not possible to download paid apps for free from the Apple app store. How would you feel if I told you that you can download all those paid apps for free but not from the app store. 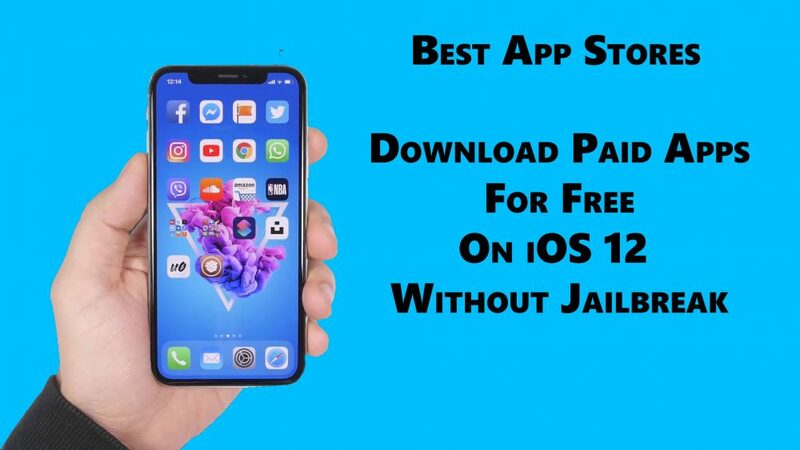 of course, you will glad to hear that there are many third-party app stores that let you download paid apps for free even without jailbreak. Guys, some of them you can download on iOS 12 and I want to tell you these third-party app stores, you can download for free and you already some of them. because most of them are very famous. so let’s go further and have a look at these app stores that allows you to download paid apps for free on iOS 12 or earlier devices. The Panda helper is on the first in my list. panda helper is new in the app stores market but it survives like an old app store. because it’s really simple to use and it has countless users under its hood. so once you use it then you will feel like you have been using it for a long time. Panda Helper is far ahead of the rest of the app stores in terms of downloading games. you can download tweaked games. like, NBA, WWE, FIFA, and even Pro Evolution Soccer, directly from Panda Helper. It has own 2 versions one is regular and other is VIP. so if you want to download panda helper from its official website then you can download just regular version from the website and you have to pay to download its VIP version. but there are lots of ways that help you to Download Panda Helper VIP free on the iOS device without jailbreak. AppValley is another such a great app store and it’s completely free even you don’t need to providing your Apple ID to download applications. it has unlimited tweaked apps that app store doesn’t have. the best thing is that you can download it on your iOS 12 devices without jailbreak. If you can’t find here the app that you are looking for then you can request to the developer to add that application on a priority basis. Appvalley pitch up the top place in the list to download all possible paid apps for free on iOS without jailbreak. TweakBox is the oldest third-party app store. but this one is still giving hard competition to other app stores. its interface is completely different and easy and if you open it then you will see that are content are stored in the 3 tabs. There are also two sections and in the one, you will find all free apps and in other, you will find all paid apps that are, originally, paid in the official App Store, but TweakBox gives you full freedom to download them for free even without jailbreak. TutuApp is the Chinese app store and it’s an amazing official app store alternative that you can download for free and without jailbreak too. it provides a plenitude of hacked, modified, and cracked iOS applications. you don’t need to jailbreak your any iOS device to download any application from the TutuApp. you don’t need to waste a single penny to download any app from the TutuApp. Regular updates by the developers make sure that TutuApp has all the applications desired by the users. Last but not least is AppEven. guys, if you want to download tweaked social apps. like, WhatsApp, Facebook, Snapchat then you don’t have any other better choice than AppEven. because it’s well known for the availability of tweaked versions of social applications. It provides you high speed to download applications, which is 50% faster than the official App Store. guys, this one is also you can download on your iOS 12 devices and it will run without jailbreak on your iPhone & iPad. also, you can download it for free. So these are my Top 5 3rd party app stores that allows you to download paid apps for free on iOS 12 or earlier devices. guys, you can download them for free and without jailbreak. hope, you will like these app stores and if you like my post then please don’t forget to share it with your friends, family members, and on the social media and also visit daily on this website. because we update here every day new and helpful articles.